Rimage Catalyst� disc publishing systems offer industrial grade hardware, front-office friendly design and professional quality disc production, an ideal choice when high-volume production is not required. 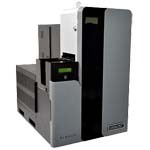 The Catalyst system comes standard with an Everest� 600 or a Prism III� printer and, a fit for any IT environment, can be ordered with or without an embedded PC. Catalyst systems, with the world�s best full-color and thermal monochrome disc printers, provide top-of-the-line printing and industrial-grade production in a front-office friendly package. With positive air flow through a front-accessible filter, quick-release recorders, front-facing hard drive bays and separate printers, Catalyst systems are designed to be easily maintained in any environment. A three-bin carousel handles up to 150 discs, either one type of disc for uninterrupted production or up to three types of discs for productive flexibility. Disc output can be configured to the external bin or one of the internal bins behind a lockable door.